Am I too (blank) to surf? 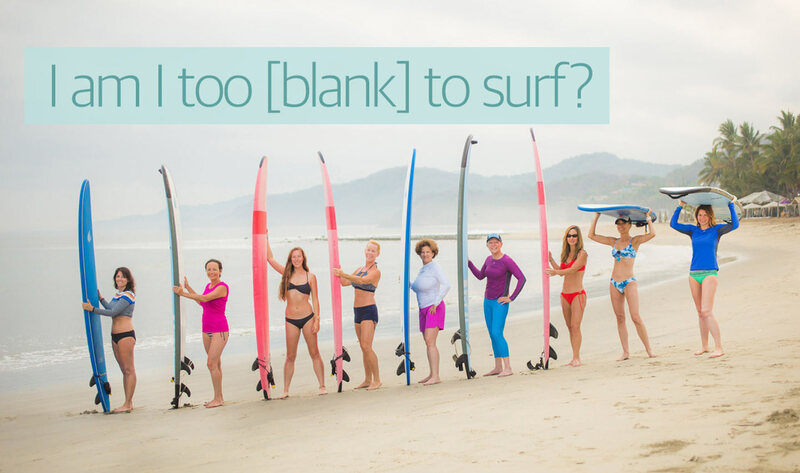 Over the years, we’ve answered a wide variety of women’s surf camp questions from Can I surf in contacts? to What do I do if I get barreled? Answers: Yes and celebrate, respectively. But certain questions seem to pop up more often, so we’ve compiled a list below. Am I too old to start surfing? New surfers starting later in life may be concerned about age, but many Las Olas guests are over 40. The diversity of ages makes for a richer experience. Our motto– We make girls out of women is absolutely true and in the end, age matters very little. In fact, I started surfing over two decades ago at 44 (you do the math), so if you’re worried about age, come surf with me. Do I have to be a good swimmer? Naturally, surfing happens in the ocean a short distance from the shore. For a positive surf experience, we require that our guests be in relatively good physical condition, competent swimmers, and comfortable in the ocean. We’ve had guests who decided to join us after taking swim lessons. Learning to overcome your fear of the water is not only an empowering experience, but learning to swim is an important life skill. It’s never too late to learn. 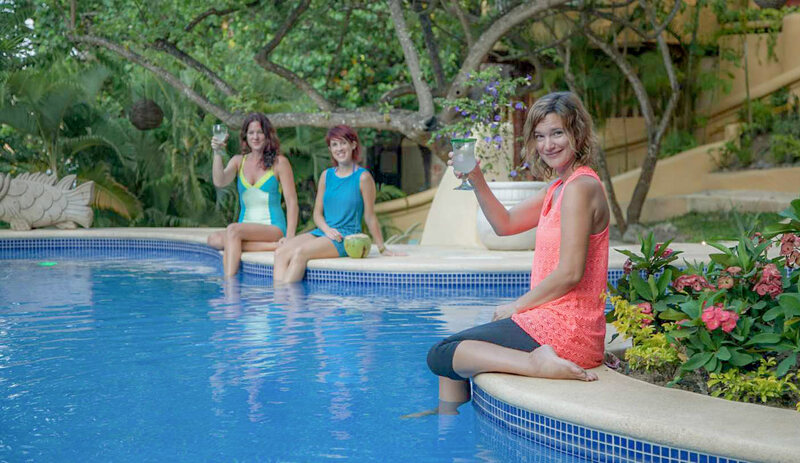 We don’t recommend Las Olas safaris for women who are pregnant, have major health problems, existing injuries, or who take medication that would restrict swimming, breathing, or impair good judgment. 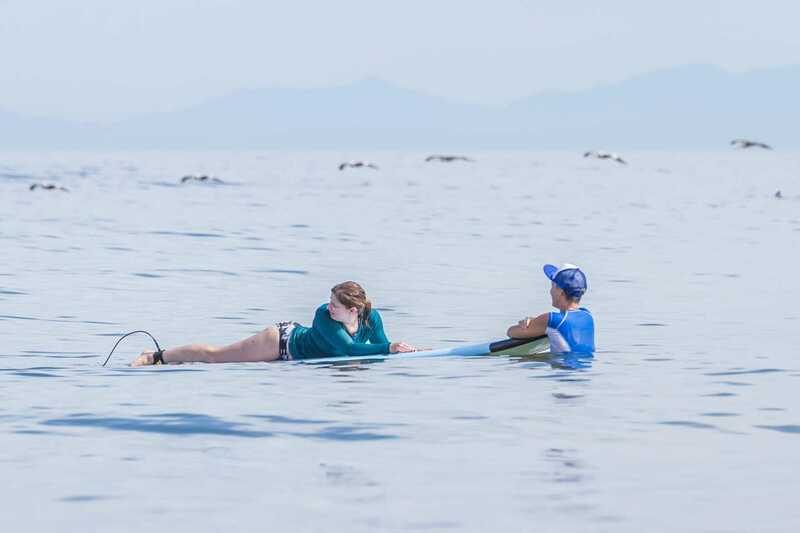 Each guest is required to assess her own abilities and physical condition before joining the surf safari. Am I too afraid to surf? That’s understandable, but remember, you’re not alone. Paddling out in the ocean for the first time is scary for anyone. Your enjoyment depends on overcoming fear through knowledge. Our surf coaches teach specific techniques to help calm the anxiety of paddling, surfer traffic, or getting caught in the white water. 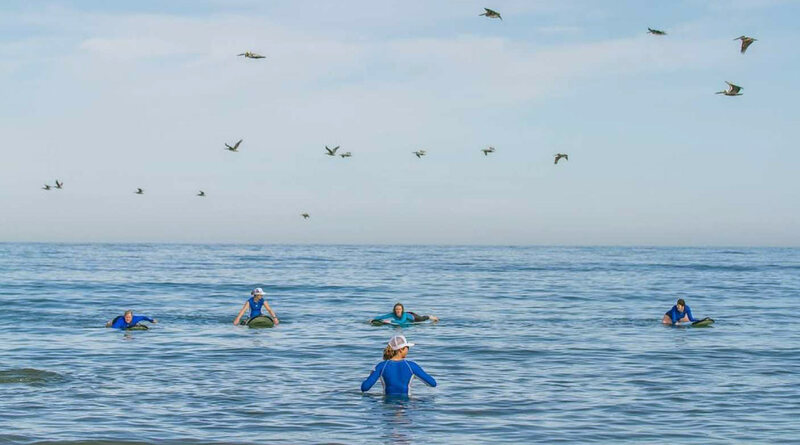 They’re skilled surfers trained in water safety, but also they’re empathetic and nurturing. Our goal is to mentally prepare you for all types of surfing adventures. You’ll enjoy a comprehensive surf orientation in our clubhouse before paddling out. The main focus is on safety, but we also strive to make the experience as rewarding and fun as possible. Typically, we surf excellent conditions for mellow longboard rides, but we’ll prepare you for just about any swell. If ever the waves are too challenging, we’ll visit other surf breaks or kick around in the white water. Everyone is allowed to learn at her own pace. I’ve heard Mexico is dangerous. Is it? From your arrival at the Puerto Vallarta airport to your villa at Las Olas surf safari, we’ll be traveling the Rivera Nayarit, a modern coastal resort region which includes the Ritz Carlton, Sheraton, Four Seasons hotels amongst other world-class properties. I’ve been traveling that route for more than 20 years, both alone and with friends. In all that time, I’ve never felt fearful or threatened. In fact, Mexican people have been unconditionally warm and generous. As a precaution, we monitor relevant sources of information daily, including the US State Department and private sources regarding safety for our guests and crew. To date, there have never been warnings against travel to the region where we operate Las Olas. Whether I’m cheering a friend on her first wave or strolling the plaza, I never reminded of the headlines up north. Instead, I’m savoring the experience that my Mexico doesn’t resemble the media’s version. My Mexico is extended families surfing and picnicking on the playa, running their shops and cafes, and doing what all small town people do around the world– enjoy life. The first step in overcoming galeophobia, the fear of sharks, is to admit there are sharks in the ocean. There, we said it. However, the ocean is big and we surf close to shore. Sharks typically avoid the warm, shallow waters of Mexico’s Pacific coast where we paddle out. In fact, since 1997, we’ve not seen a shark nor heard of an encounter in the area where our surf retreat is located. But dodging pelican droppings, that’s a different story. Can I go by myself? Most definitely! Although we do offer private bedrooms, many guests attending solo opt to share a room in villas with plenty of outdoor living space. It’s very common for new friendships to blossom instantly. Just know by the time you leave Las Olas, you may have a dozen new friends. Surfing is a sport enjoyed by women of all body types, ages, and backgrounds. There’s no guarantee you’ll become the next champion surfer, but splashing around at the edge of the ocean can be a positive, soulful experience. How it affects you is personal and not based on anyone else’s perceptions. If you’re in good physical condition and have the desire to try surfing, you can surf. For a quick tour of Las Olas surf vacations, visit At A Glance.